A new school year is here! Whether this is met with joy or apprehension, there is a ten month calendar year ahead of us. We focus heaps of our time on our kid’s schedules, activities and how they are going to function during the year. There’s nothing wrong with this. What we tend to look over is the plan for our own wellness and sanity. As a parent, it is SUPER easy to spend ten months being pulled in a million directions. We get tired and can feel overwhelmed. You need to make yourself a priority. You need a plan for you. Let’s take some time and check out some back to school advice for parents. Self care is WAY important! Your self care can be 10 minutes to a whole weekend. Do what you (realistically) can do. You may LOVE to take a walk, ride your bike, have a cup of coffee on your porch without screaming kids. Get creative. When WE take time out to take care of US our emotional and physical tank is able to refill a bit. We are more present and healthy when we allow ourself the ability to breathe and enjoy the things we…well, enjoy in life. Do not neglect yourself. When we keep in high gear something gives. There is an impact on our relationships and quality of living. It’s just not worth placing your needs and you time on the back burner. A huge mistake is feeling a sense of guilt in saying ‘no’ to our kids interests. Being busy is good. When the wheels spin at 124 mph, this is not good. Balance is critical. Find what form of balance works for your family. Make sure there is adequate family time. Meal time together is SO important. Being on call, driving somewhere for something seven days a week to seven different places is not always the best bet. The school year may have started, but it is not too late to re-evaluate where your balance is and where it needs to be.I get that we want our kids to be balanced, involved and well rounded. It’s a tricky line that is too often crossed leaving the parent and kids exhausted. 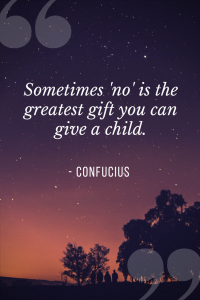 Sometimes saying ‘no’ is the greatest gift you can give your child. We provide our kids with a ton of back to school advice. There are commercials, assemblies and class chats on how important balance and goals are for the year. Funny thing is, we’re at the helm and we so often neglect to apply these lessons to our own lives. It’s easy to do. I struggle with this myself. You want to make your kids happy. You want the world for them. To take time to recharge can feel selfish or can be met with crazy guilt. The truth is, it’s the opposite. This is a lesson I am in the process of learning myself. We are all a work in progress. When we recharge, it’s a gift to ourselves and our loved ones. How can you argue with something so simple and necessary? So let’s take this step together! There’s power in numbers! My personal challenge for this school year is to be more aware of the time I need to recharge. I aim to step away from guilt and apprehension and take ‘me’ time. I am confident it will do nothing but enhance all areas of my life. My hope is that you will also see your value and need for self care. You, my friend, are worth it. May your week allow for time to reflect, recharge and get your ‘YOU’ time on! Peace, love & parenting!